A creamy moisturizer with anti-aging benefits: Rich and velvety, the Precious Cream is a smooth yet easily absorbed anti-aging treatment. Immortelle essential oil is concentrated into micro-capsules for controlled 24 hours release. For softer skin and a radiant glow Precious Cream can be used in the morning, as a rich moisturizer, or as a night-time treatment. Anticipate more supple, softer skin when used continuously morning and/or night. For best results, apply to face and neck after cleansing and toning. I have purchased several L'occitane creams in the past; my favorite being Milk Concentrate. Immortelle is simply just too heavy for my skin. Maybe if a person living in northern climbs the heaviness would not be as pronounced but here in Florida a lighter cream is called for.Immortelle may also be for someone with very dry skin.Generally L'occitane is a very good product line but not this one for me. I received this as a sample. I love it and will buy it. My skin feels wonderful. The smell is heavenly! I cannot live wthout this moisturizer...I love everything about it. I've been looking for a good anti-aging day cream for a while & I've tried most expensive brands from Dior Capture totale, Chanel, La Mer, Shiseido future solutions, etc, uff too much $$$!! Thank God I found & fell in love with this French "organic" cream. I've switched all my skin care to products to those only with natural ingredients, essential oils, no colors, fragances or parabens yet with good anti-aging results. In fact I also started using the night cream (Very Precious) and my friends tell me that my skin looks bright, firm & glows!! I'm 43 and people usually guess I'm 34...ha, ha. Mercie Beaucoup L'Occitane!! This cream is great - w a light fragrance and absorbs quickly. It leaves your face feeling so smooth. I put it in the fridge sometimes and let it cool before I put it on my face. Buying my second jar. This is a great moisturizer. I have dry skin in New Mexico sun. I've tried many and love this product! Very deep moisturizer with a pleasant smell. I have sensitive skin and have no troubles with this moisturizer. Worth the money compared to others. I've spent thousands and thousands of dollars in the last decade trying to find good moisturizing cream/lotion. I've had them - from La Mer, Prevage to Philosophy, DDF to Oil of O'Lay. The list can go on and on. Some were better than others, some didn't do anything, and some were just average for the price. 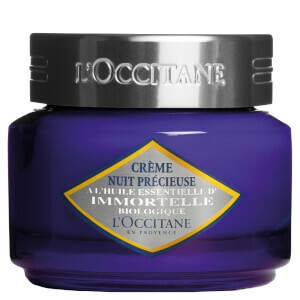 I'm glad to say that L'Occitane Immortelle Precious Cream is the best one I've tried so far and I"m relieved I won't be buying anything new next month. I"ll stick with this cream for a while. It absorbs quickly, it's super lightweight, doesn't have too many chemicals, has great texture. My skin felt soft. I use it as a night cream and the texture of my skin improves a lot after several days. After using this product for about 1 week, I notice my the texture of skin has improved. My pores are smaller, my face is smoother and softer. And most important of all, it looks better.